On the show this week, I discuss the following. Who Pro Football Focus was talking about when they said “He needs to improve his location, in particular, struggling to beat tight coverage at every level of the defense” before the 2016 NFL draft. Hint, he’s killing it in the NFL right now. To listen, click on the play button. To download the podcast, click here. After a week of utter chaos, the committee told us they still like Michigan and Clemson over Louisville. This isn’t what my algorithm expects from the committee. Usually, teams move down when they lose. Michigan lost in stunning fashion to Iowa but stayed at 3rd. Clemson had a similar loss to Pittsburgh but only dropped from 2nd to 4th. The loser in these decisions is Louisville at 5th. With the strange behavior of this committee, I’m starting to believe that my 55% for Louisville to make the playoff is too high. But maybe not. Louisville has to hope that Ohio State wins the Big Ten, which does two things. Eliminates Michigan, since Ohio State plays them next week. Eliminates Ohio State as another potential one loss non-conference champions looking to get into the playoff. Then Louisville needs a two or three loss team to win the Pac-12 (Colorado, Utah, USC still in contention for the South), which would eliminate Washington from contention. This all assumes that Clemson wins the ACC Atlantic, denying Louisville the chance to win the ACC. Still, their likelihood is probably less than 55%. To check out all of my playoff odds at Bleacher Report, click here. Whoa, Louisville. The Cardinals stomped over Florida State by a 63-20 score, a win that propels them from 12th to 3rd in my college football rankings. I think this is a bit of an overreaction. Louisville has looked fantastic, but if they played Florida State 100 times, they won’t win by 43 or more in each game. Also, remember Louisville ranked 19th and 23rd in the preseason AP and coaches poll, which are powerful predictors of team strength. They’re clearly better than that. But 3rd in the nation? I need to see more games to believe that. 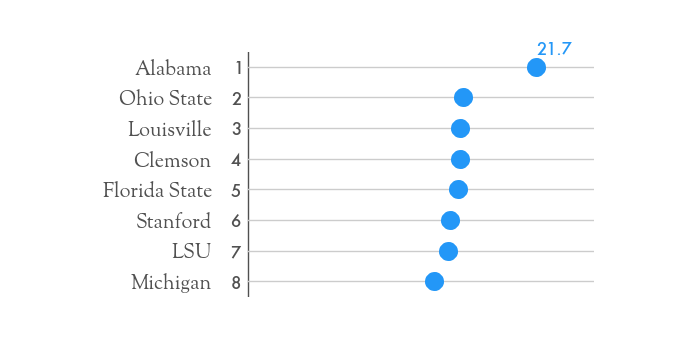 As always, you can find the rankings for all college football teams here. After Louisville’s huge win over Florida State, I was worried about how the playoff odds would look for the Cardinals. I’ve been playing with a new model for team rankings the first few weeks of the season, and they’re like your Grandpa that doesn’t have a cell phone. They don’t react too fast to new data. 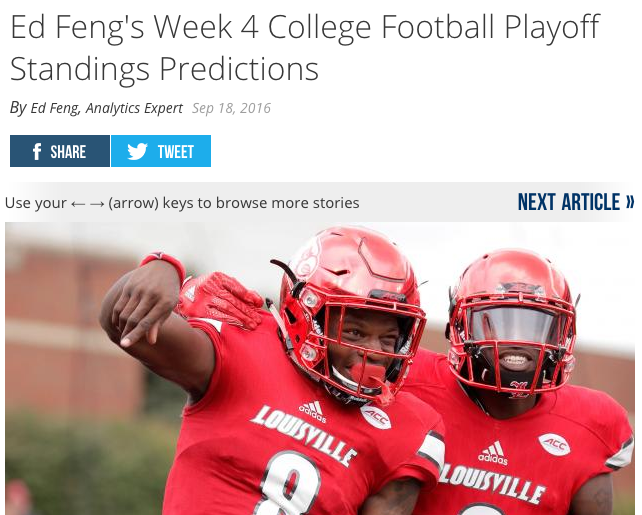 But the new model does consider Louisville’s extraordinary performance this season, and they have a 48.8% chance to make the playoff. The problem was Florida State. Despite the huge loss, the Seminoles still have a 38.8% chance to make the playoff. That seems high, but there’s a good reason. To check out all my playoff odds on Bleacher Report and the reasons why Florida State still has a better chance at the playoffs than Ohio State, click here. Which school has the best college basketball program? It’s an easy question to answer with only analytics. We could take an average rating from computer rankings over the past 10 years to find the best programs. However, college basketball is a sport that almost entirely relies on the postseason for its popularity. Any legitimate ranking must consider success in the NCAA tournament. To balance analytics with post season success, I propose ranking programs by Sweet 16 appearances over the past 10 years. With such a long time period, it’s difficult for a non-elite team by the numbers to have enough tournament success to make this list. The top 10 below includes all the traditional college basketball powers. In addition, the Sweet 16 seems like an appropriate balance between making the tournament and winning the entire contest. It’s not enough to just make the field every year, but there’s too much randomness in winning the tourney. In the past 10 years, only two programs have won more than one tournament (Florida and Connecticut), and neither made the tournament in 2015. To break ties among programs with the same number of Sweet 16 appearances over the last 10 years, I looked at appearances in the past 9 seasons. If this didn’t break the tie, I looked at successively shorter time periods until one program came out ahead. The rankings below show the top 10 college basketball programs by Sweet 16 appearances. Only one program had 7 appearances over 10 years, which shows the parity in college basketball. 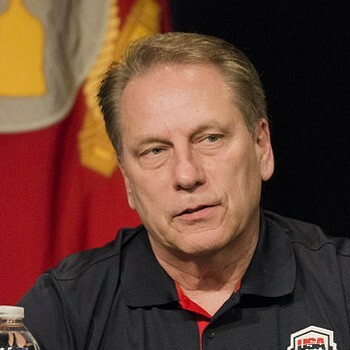 Even the best programs have years in which they lose before the second weekend of the tournament. Gonzaga has made the tournament each of the past 10 years but did not make this list. While they have become a brand name program in college basketball, Gonzaga has struggled in the tournament with only 3 Sweet 16 appearances. Ohio State and UCLA have 5 Sweet 16 appearances each but lost out to the teams below based on the tie breaker method. Ohio State hasn’t make the second weekend of the tournament the last two years, while UCLA had 3 straight appearances early in the 10 year window. Xavier is the only program in the top 10 not from a power conference. Sean Miller led the Musketeers to the first two Sweet 16 appearances, while Chris Mack has reached the Sweet 16 in half of his 6 seasons. Bo Ryan has made the NCAA tournament in each of his 14 years as Wisconsin’s coach. They have made the Sweet 16 in half of the past 10 years, and the 2015 team led by Frank Kaminsky might be the best of all these teams. Sean Miller coached Arizona for the last 4 Sweet 16 appearances. However, Arizona only had 1 appearance between 2006 and 2010 as the program transitioned from long time coach Lute Olsen to Miller. Arizona has a great team in 2015, and I think they have the best chance of beating Kentucky should they play in the Final Four. With their undefeated season so far in 2014-2015, one might expect Kentucky to be higher on this list. However, the Wildcats struggled in the early years of this 10 year period as they transitioned from Tubby Smith to Billy Gillispie (whoa, remember him?) to John Calipari. Even within the last 5 years, Kentucky had a down year in 2013 when they lost to Robert Morris in the first round of the NIT. Even the best programs can’t escape the vagaries of luck in this era of one and done players. Billy Donovan has had tremendous success at Florida, winning back to back championships in 2006 and 2007. However, it doesn’t always run smoothly in Gainesville. Florida didn’t make the tournament in 2008 and 2009 when the stars from the championship teams left. They also didn’t make the tournament this year. Back in the Christian Laettner years, Duke made four straight Final Four appearances and won two championships. Even Mike Krzyzewski can’t duplicate that success in this era of parity and one and done players. Duke has fallen victim to two of the biggest Round of 64 upsets recently, as they lost to 15 seed Lehigh in 2012 and 14 seed Mercer in 2014. Bill Self has an incredible streak of 11 straight Big 12 regular season championships. He also hasn’t made the Sweet 16 the past two seasons. In 2015, Kansas lost Wichita State, a program in their own state they refuse to schedule during the regular season. I thought North Carolina would be lower on this list, as Roy Williams has had some subpar teams in recent memory. North Carolina didn’t make the tournament in 2010, and they didn’t make the Sweet 16 in 2013 and 2014. However, they still have 6 appearances over the last 10 years and squeak ahead of Kansas with their Sweet 16 appearance in 2015. Rick Pitino has the Louisville program in great shape, as they almost always feature a top 10 defense by adjusted points per possession. However, their offense has been the problem in 2015. If they can find enough offense in the soft East Region this year, they could make another Final Four appearance. 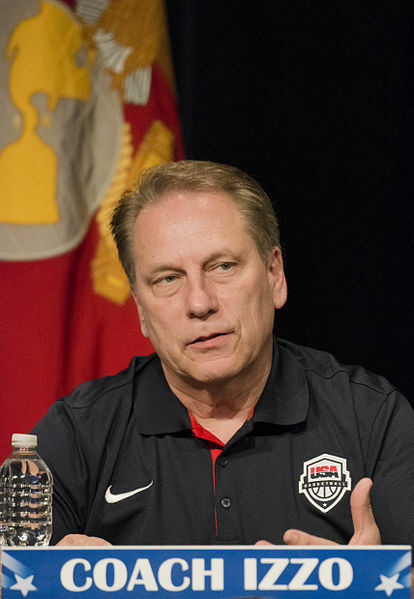 Tom Izzo’s teams continue to perform well in March. In 2015, Michigan State beat Virginia to make the Sweet 16 for the 7th time over the last 10 years, tops in the country. I doubt Michigan State would have the highest rating averaged over the past 10 seasons, but they continue to have success in the tournament.